Through hand-on experience, learn how to prepare for the wilderness and survive the forces of nature. This 2-day program will highlight the most critical concepts of wilderness survival. 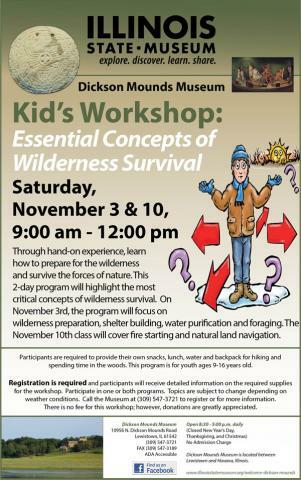 On November 3rd, the program will focus on wilderness preparation, shelter building, water purification and foraging. The November 10th class will cover fire starting and natural land navigation. Participants are required to provide their own snacks, lunch, water and backpack for hiking and spending time in the woods. This program is for youth ages 9-16 years old. Registration is required and participants will receive detailed information on the required supplies for the workshop. Participate in one or both programs. Topics are subject to change depending on weather conditions. Call the Museum at (309) 547-3721 to register or for more information. There is no fee for this workshop; however, donations are greatly appreciated.